Actually, this isn’t really about goose poo, although it might have done if my lunchtime snooze in St James’ Park had gone wrong. It’s September 22nd and the sun is shining on central London. Until August this little island off the north west coast of Europe was having a blessed summer. Then I got married. August was rubbish. Autumnal and spiteful. And now we are nearing the end of September and it must be around 25 degrees out there – hence the lunchtime snooze and the concern about goose poo. I have frequent discussions about the weather with Mrs Monkeysized. She is of the opinion that everything needs to be perfect all the time; anything less is a cause for complaint. She is, after all, Italian, and therefore overly demanding when it comes to sunshine (she also relishes complaining). I’m from the blowy north east of England and therefore slightly more tolerant of the capricious turns that the weather takes. For me, coping with what one doesn’t necessarily want is also a skill that is useful in appreciating life. 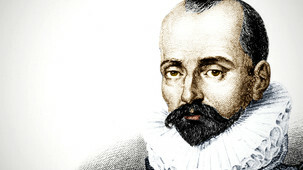 On the way back from the park I listened to an interesting edition of BBC radio 4’s ‘Great Lives’, looking at the life of Michel de Montaigne. I enjoyed the sun in the knowledge that it was an unexpected and temporary gift. And when I got up, I was delighted not to have an arm that smelled of goose poo. On Saturday I’ll go to watch Middlesbrough taking on Watford, pleased that even if I were a multi-millionaire I would still be doing exactly the same thing, no matter how badly they play. And it’ll probably be raining. please compare these two lovely graphs and you’ll realise that it’s not a difference in philosophy but standards….